Smartwatches have barely been on sale for six months yet that hasn’t stopped engineers moving onto the next level of wearable high-tech devices - the smart ring. 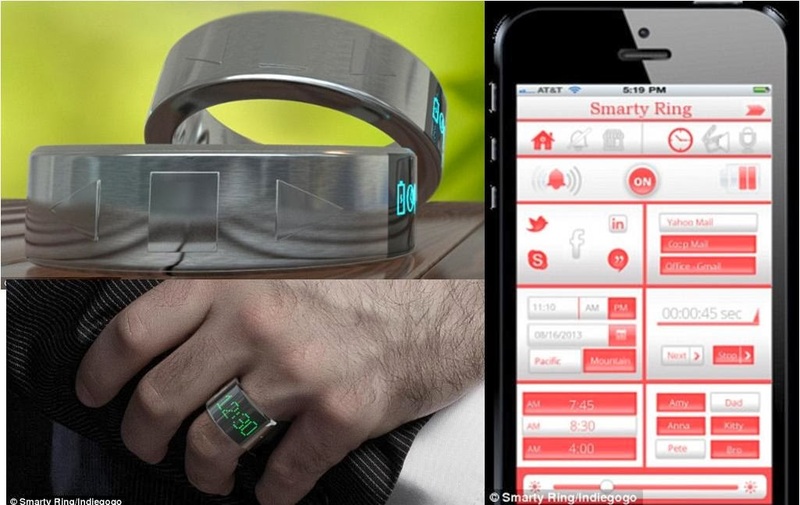 Called Smarty Ring, the stainless steel gadget connects to smartphones via Bluetooth using a dedicated app. Its LED screen lights up each time the wearer gets an email, text message, Facebook and Twitter notifications and phone calls, and the ring can also be used as a remote control. Smarty Ring is the brainchild of Chennai-based engineer Ashok Kumar. Kumar recently set up an Indiegogo campaign to raise $40,000 (£24,000) funding for the high-tech gadget and has already smashed this goal by achieving in excess of $300,000 (£182,000). The ring is fitted with a Bluetooth 4.0 sensor that connects to any Android or iOS device through the dedicated Smarty Ring app. The app lets uses change the Smarty Ring's profile, set time zones and adjust the clock and set up speed dials. When there are no notifications to display, the ring shows the time. When a call is received on the paired smartphone, wearers can choose to answer or reject the call using buttons on the side of the ring. Calls can also be placed using pre-programmed speed dials, although the calls themselves are made through the handset. These buttons also double up as a remote control to play or stop music on the phone and open the smartphone’s camera. Various icons light up to indicate when the wearer receives a text, email, Facebook, Twitter, Google+ message, Google Hangout alert and Skype call. There is additionally a stopwatch, countdown timer and alarm built in. As an extra feature, the ring will also sound an alarm if the phone is taken more than 30 feet away to alert to potential thefts. However, the alarm will only sound if the owner is wearing the cyber jewellery. Finally, the Smarty Ring is waterproof, according to the Indiegogo campaign: 'The exterior of the Smarty Ring is not only fashionable - but waterproof. According to the campaign, the ring will retail at $275 (£167) when it goes on sale from April next year. While people who back the campaign can get a Smarty Ring for a discounted $175 (£106). Elsewhere, Kumar claims the ring will have a flexible 22mAh battery that will last for 24 hours ‘guaranteed.’ This battery is then charged on a wireless charging pad. The ring can be ordered to size, too, using a printout of a paper ruler supplied by the company. In September, designer Gusztav Szikszai unveiled a similar device called the Ring Clock - a ring that tells users the time when they twist it on their finger. However, the Ring Clock does not have any smart features.